t.Caught in a wicked game of cat and mouse, Detective Helen Grace finds herself trapped among the hunted in the darkest thriller yet from the international bestselling author of Little Boy Blue and Eeny Meeny. Framed for a murder she didn't commit. As one of HM Prison Holloway's most high-profile new inmates, Detective Helen Grace has a target on her back with nowhere to hide. Helen has made a long list of enemies over the course of her career-some are incarcerated within these very walls. When one of her fellow prisoners is found mutilated and murdered in her locked cell, it's clear that the killer is someone on the inside. But time is running out for Helen as she races to expose the person who framed her, and the body count in the prison starts climbing. Helen will need to draw on all her investigative skills and instincts to catch the serial killer behind these murders and seek the truth-unless the killer finds her first. 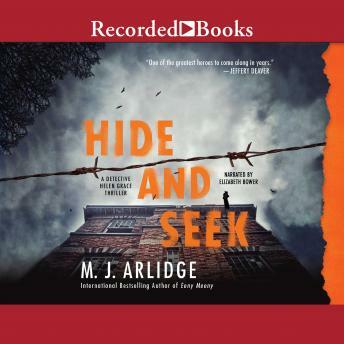 Author bio: M. J. Arlidge is the international bestselling author of the Detective Helen Grace thrillers, including Little Boy Blue, Liar Liar, The Doll's House, Pop Goes the Weasel and his debut, Eeny Meeny, which has been sold in twenty-nine countries. He has worked in television for the past fifteen years.